Plan a confirmation party after the church service. Have everything ready to go on the big day by doing confirmation party planning in advance of the religious ceremony. Confirmation ceremonies are an important declaration of faith, so hosting a party after the church event is a natural way to recognize a child or teen's faith. Confirmation ceremonies are done within a church service. Host the party immediately after the service, in the afternoon or in the evening. Some churches may host a meet-and-greet reception for members to congratulate the kids after the service. In these cases, host an evening party for close family members and friends. The location of the party depends upon several things: time of service, number of people invited and the parent and child's preferences regarding preparation. Longer services that run close to the noon hour make it difficult for parents to get food prepared for guests; in this case, renting a banquet room and hosting a catered meal makes sense. This is also a good solution for people who live a long distance from their church or are too busy to prepare their home for guests. Hosting a party at home is cost-effective and simple for some families. Depending upon the size of the home and season, opening up a patio or deck is a good way to provide more space for guests. If the basement or kitchen of the church is not in use, members can rent the facilities for a nominal fee in many congregations. Hosting the party at the church makes it easy and quick for parents and hosts to prepare before and after the service. Reserve the area as soon as possible, as other families may be interested. Send out party invitations to close friends and family members. Remember to include the pastor/minister/priest and family on the list, as well as godparents and special Sunday school teachers or spiritual advisors. Nourishment for the soul occurred during the church service, so feed guests' bodies during the party. 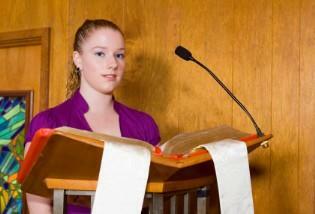 Confirmation is often a solemn but momentous occasion in a child or teenager's life. Mark the formality of the occasion by serving a seated meal or formal buffet. Skip the plastic dinnerware and paper plates in favor of bringing out family silverware and the best china for the main meal. Before eating, the pastor, confirmed child or parents should say a table grace. It can be as simple as The Lord's Prayer or a prayer written especially for the occasion. The dessert at a confirmation party is usually a decorated cake. Designs often take the form of Bibles; this can include open Bibles with a verse printed, crosses, or praying hands. Disposable napkins and plates with a design that matches the invitations are available at party supply stores or online. Alternatively, use formal dessert plates for a more luxurious touch. The main activities at a confirmation party are congratulating the confirmed child and sharing a meal. Often, children will receive religious gifts from parents, godparents and other special people in their lives. Open gifts before or after the meal. Parents who plan to give their child a religious promise ring as a confirmation gift may want to make it somewhat ceremonial. Giving a short speech about faith, God, Jesus and the child is appropriate before bestowing the ring upon the confirmant. At parties with young children, have a few games or activities on hand. Print Bible Bingo cards using a home computer. Set out religious board games like Bible Trivia and BibleOpoly. Decorations for a confirmation party tend to be understated and refined. Cover tables in white or light-colored cloths. Place a small floral arrangement or balloon bouquet near a guest-book sign-in or dessert table. Decorated cakes often serve as centerpieces until served. Streamers and banners are also appropriate decorations at a confirmation party. By decorating with personal items of faith, the child's party is more meaningful to him/herself and guests that attend. Confirmation party planning may be stressful, but it is important to mark this significant religious milestone in a child or teen's life.